Internationally known mosaic artist Patrizia Salles, presents for the first time her series of mixed media works in correlation with the 14th year of Contemporary Art Day, organized by AMACI-Associazione dei Musei d’Arte Contemporanea Italiani. The series examines the venerated deities and iconic figures of the ancients, and the overlapping and merging Mediterranean cultures. These voices and reflections of the idolized - a revelation of the past - mirror who we are today. The overlapping of techniques and materials in Patrizia’s work perfectly translate the overlapping of cultures, images and ideas not only within the Mediterranean, but globally. Patrizia melds her many years of living and traveling in Europe and North Africa — six of those years spent in Rome — into a unique art style. "I remember my mother taking the family to see museums, Greek and Roman temples, ancient cathedrals, fountains and palaces. It furnished a strong and diverse foundation for my art." Patrizia’s flowing, mixed media art bears witness to these varied influences, bridging the ancient with her cur-rent contemporary style. "My first masterpiece was at age five, a tiny clay basket with carrots, celery and other veg-gies. I have always been able to lose myself in my art, for hours, loving every minute of it." After a 20-year career in marketing and graphic design Patrizia made the decision to return to her art, first exploring and creating mosaics in her Houston and Caribbean studios for over fifteen years. Having been born in France, Patrizia has now come full cycle as she establishes a Euro-based studio to continue her art studies in ancient western civilizations. Now presented in her new body of work, a further evolution of her artistic techniques and style "Voices from the Past." 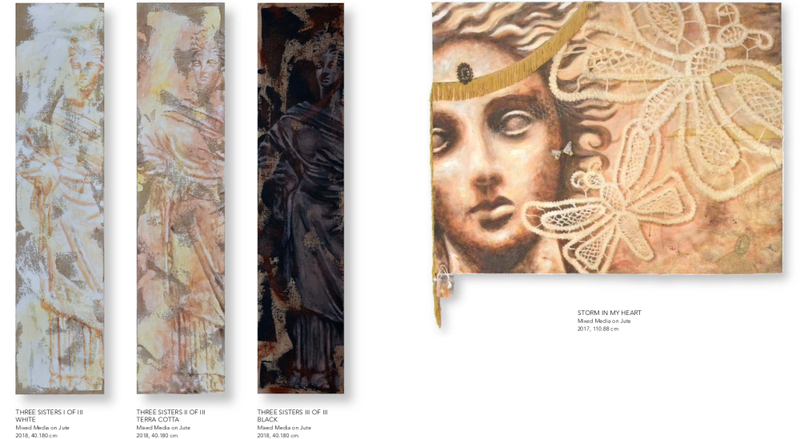 Patrizia’s art is collected internationally.